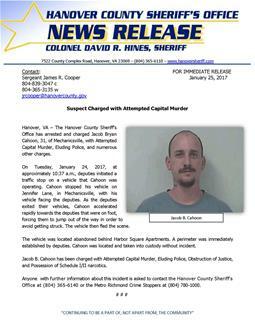 On Tuesday, January 24, 2017, at approximately 10:37 a.m., deputies initiated a traffic stop on a vehicle that Cahoon was operating. Cahoon stopped his vehicle on Jennifer Lane, in Mechanicsville, with his vehicle facing the deputies. As the deputies exited their vehicles, Cahoon accelerated rapidly towards the deputies that were on foot, forcing them to jump out of the way in order to avoid getting struck. The vehicle then fled the scene. The vehicle was located abandoned behind Harbor Square Apartments. A perimeter was immediately established by deputies. Cahoon was located and taken into custody without incident. Jacob B. Cahoon has been charged with Attempted Capital Murder, Eluding Police, Obstruction of Justice, and Possession of Schedule I/II narcotics. Anyone with further information about this incident is asked to contact the Hanover County Sheriff’s Office at (804) 365-6140 or the Metro Richmond Crime Stoppers at (804) 780-1000.